In most beef operations, regardless of size, the single largest cost is feed. Typically, feed represents 50-60% of total costs in the cow-calf sector, with a large proportion of these costs usually attributed to harvest feeds and forages. Often, as acreage decreases per cow managed, more harvested feeds and forages are going to be required. However, proper planning and implementation of winter grazing can dramatically reduce annual cow costs without sacrificing productivity and profit. Over the last 20 years, multiple reports of beef business record analysis have noted that the most profitable beef herds are the ones that utilize some sort of extended grazing system. Whether it is through the use of stockpiled grasses, corn stalk grazing, or a combination thereof, more grazing equals more profit. Logically, the more forage that the cow can harvest for herself, they less we have to deliver to her. Thus, increasing grazing days not only decreases feed cost, but also reduces fuel use, wear and tear on equipment, and labor used to deliver it. Most producers in the Midwest that graze cows year-round need about 4 acres per cow for annual forage production. So how do you go about developing a winter grazing system, and what do you need to be wary of? First, you have to know where you are starting from. Do you know how many grazing days you had this year, how much supplemental feed you delivered, and how much harvested forages were fed? How many cows do you have this year? Are you maintaining the herd, expanding, or reducing herd size as you move forward? Without this information, it will be very challenging to gauge progress. Another key component that should be considered is the array of forage species you have access to. Tall fescue is the most commonly stockpiled forage that producers use, but a variety of cool season grasses make acceptable stockpiled forages. The one are of contention, even among many grazing experts, is the best method for stockpiling forages in the first place, and in particular tall fescue. Some producers graze or hay fescue in the early-to-mid summer period and then allow it to grow until the first killing frost. Other producers that have increased pasture availability may leave the stockpile pasture ungrazed the entire summer and graze it only in the fall and winter. The first option results in higher quality grass that is less mature at the time of winter grazing, but will obviously reduce tonnage available. With this strategy, less supplement may be needed while grazing due to the higher quality forage. On the other hand, leaving the stockpile pasture undisturbed all summer will significantly increase the amount of forage available, but quality will be lower. This may be of concern if you plan to use fall-calving cows to graze the stockpiles, as they will likely need some sort of supplementation to meet nutritional requirements for lactation. The other consideration that should be made to maximize stockpiles is the grazing strategy. The low input option is to turn cows out and let them graze the entire acreage. Unfortunately, a large majority of the forage will be wasted and trampled. Because the forage is no longer growing, rotational grazing is not a viable option either. The best use of the existing forage is to strip graze. In other words, fence off a strip of new forage every day or every few days that give the cows what they need to meet their nutrition requirements. With this method, some producers have found that as much as 85% of the stockpile is consumed vs. wasted by the cow. While it may increase labor, the return on investment is typically quite good. One point of order, don’t be scared of the snow! Cows can graze in snow up to 18 inched deep (although many producers don’t like to push the limit that far). If snow is an issue, one of the more progressive graziers I know will push a strip of snow off of the grass with a tractor blade, similar in concept to a strip grazing system, until the snow melts. Admittedly, this may be more problematic for producers further north where the snow does not melt once winter fully sets in. The other forage that fits well into a winter grazing program is corn stalks. In the Midwest, most of us don’t have to look too far out the window to find a corn field, and thus availability of forage is typically not limiting. What may be limiting is legal perimeter legal. While a single strand of hot wire may keep cattle in, this fence likely will not protect you in the event that cows would get out and cause damage to property or a vehicle. Check your local state laws for what constitutes a legal fence. The typical rule of thumb is that approximately 16 pounds of leaf and husk material will be left behind at harvest for every bushel of corn per acre. For example, if the field made 150 bushels/acre, then there should be about 2400 pounds of leaf and husk per acre. We concentrate on the leaf and husk, because this is the most palatable and digestible portion of the plant. Once cows have sought out and consumed any grain left in the field, the leaf and husk is what they will eat next. Keeping this in mind, it is not suggested to graze corn fields that have had significant wind damage prior to harvest. The ear drop that may have occurred could lead to acidosis, founder, or even death in cattle when too much corn is consumed too quickly. It may be assumed that a cow will eat approximately 2.5% of her body weight in corn stalks per day. Thus, if she weighs 1300 pounds, she will consume about 32.5 pounds of corn stalks per day. Combine this with the leaf and husk estimate to determine how many days you can graze a given size group of cows. Be conservative and assume cows will only graze half of the leaf and husk. The other half will likely be trampled or deteriorate over time. If you are limited in your access to stalks, strip grazing may be an effective use of this forage as well. If you have not made a grazing plan for this winter or do not have access to stockpiled forage or stalks, there are still a few things you can do this winter to prepare for an improved grazing season next year. 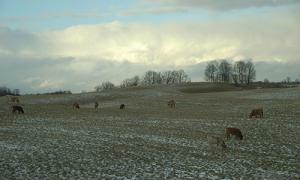 If you are fortunate enough to have not had snow yet, assess the number of forage species in your pasture. If legumes are limited, consider frost seeding red clover when the freeze-thaw cycles begin in late winter/early spring. Typically 3-5 pounds per acre of red clover should be broadcast spread every 2 or 3 years. The clover will help with nitrogen fixing for the surrounding grasses, and will also provide some extra tonnage and energy during the summer months when cool season grasses slow their growth. Just because grass isn’t growing doesn’t mean you can’t be working on your pasture. So, as winter sets in, think grazing season! And as always, consult with the team of experts you have assembled including your nutritionist, beef extension specialist, and herd health veterinarian.